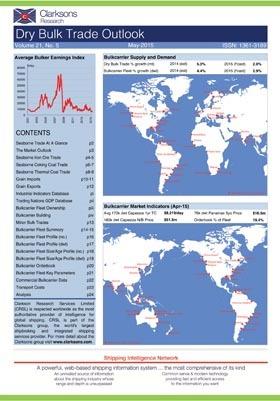 Dry Bulk Trade Outlook tracks the dry bulk trades. Detailed information is gathered from many sources by the Clarksons Market Research Group and summarised. Detailed tables are provided for iron ore, thermal and coking coal and grain trades and 22 minor bulk trades. To complete the supply/demand picture Dry Bulk Trade Outlook provides a detailed monthly analysis of the dry bulk fleet, covering 20 size groups. Forecasts of trade and ship demand are provided.